We've long known that beneath the scenic landscapes of Yellowstone National Park sleeps a supervolcano with a giant chamber of hot, partly molten rock below it. Though it hasn't risen from slumber in nearly 70,000 years, many wonder when Yellowstone volcano will awaken and erupt again. According to new research at Arizona State University, there may be a way to predict when that happens. While geological processes don't follow a schedule, petrologist Christy Till, a professor in ASU's School of Earth and Space Exploration, has produced one way to estimate when Yellowstone might erupt again. "We find that the last time Yellowstone erupted after sitting dormant for a long time, the eruption was triggered within 10 months of new magma moving into the base of the volcano, while other times it erupted closer to the 10 year mark," says Till. The new study, published Wednesday in the journal Geology, is based on examinations of the volcano's distant past combined with advanced microanalytical techniques. Till and her colleagues were the first to use NanoSIMS ion probe measurements to document very sharp chemical concentration gradients in magma crystals, which allow a calculation of the timescale between reheating and eruption for the magma. This does not mean that Yellowstone will erupt in 10 months, or even 10 years. The countdown clock starts ticking when there is evidence of magma moving into the crust. If that happens, there will be some notice as Yellowstone is monitored by numerous instruments that can detect precursors to eruptions such as earthquake swarms caused by magma moving beneath the surface. And if history is a good predictor of the future, the next eruption won't be cataclysmic. Geologic evidence suggests that Yellowstone has produced three enormous eruptions within the past 2.1 million years, but these are not the only type of eruptions that can occur. Volcanologists say there have been more than 23 smaller eruptions at Yellowstone since the last major eruption approximately 640,000 years ago. The most recent small eruption occurred approximately 70,000 years ago. If a magma doesn't erupt, it will sit in the crust and slowly cool, forming crystals. The magma will sit in that state - mostly crystals with a tiny amount of liquid magma - for a very long time. Over thousands of years, the last little bit of this magma will crystallize unless it becomes reheated and reignites another eruption. For Till and her colleagues, the question was, "How quickly can you reheat a cooled magma chamber and get it to erupt?" Till collected samples from lava flows and analyzed the crystals in them with the NanoSIMS. The crystals from the magma chamber grow zones like tree rings, which allow a reconstruction of their history and changes in their environment through time. 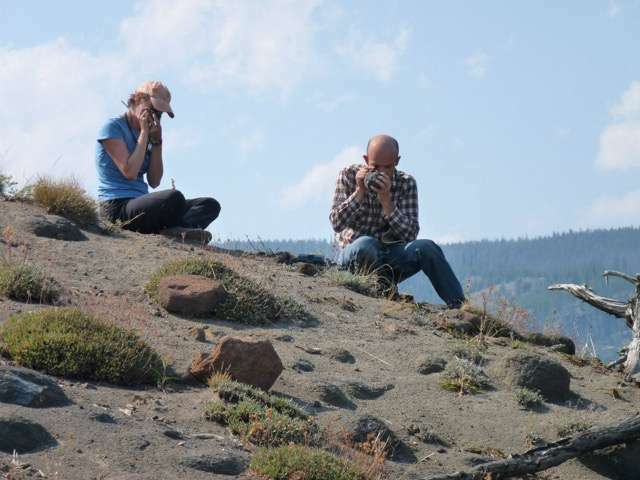 "Our results suggest an eruption at the beginning of Yellowstone's most recent volcanic cycle was triggered within 10 months after reheating of a mostly crystallized magma reservoir following a 220,000-year period of volcanic quiescence," says Till. "A similarly energetic reheating of Yellowstone's current sub-surface magma bodies could end approximately 70,000 years of volcanic repose and lead to a future eruption over similar timescales."